The Brandon Artists Guild is a vibrant group of more than 30 Vermont artists and artisans. Founded in 1999 under the leadership of renowned folk artist Warren Kimble, our aim is to promote the arts in and around Brandon, Vermont. The organization came to life when a group of twelve local artists rented an unused downtown storefront and turned it into a cooperative gallery. They called themselves and their gallery space the Brandon Artists Guild. The Guild blossomed in 2003 with the advent of “The Really Really Pig Show“. Forty life-sized fiberglas pigs were designed and decorated by Guild artists, talented town members and students from eight area schools. Small-town Brandon had never undertaken such an ambitious art project, but the enthusiasm of the Guild members was contagious and soon the entire community became involved. The pigs were unveiled at our traditional Memorial Day parade, displayed all summer throughout the village and finally auctioned off on a beautiful October weekend. As the first event of its kind in Vermont, the Pig Show attracted thousands of visitors and established Brandon as an exciting art destination. Funds generated from this spectacular effort enabled us to purchase and renovate the Guild gallery building, attract new members and establish our cooperative as an essential stop for Vermont art lovers. The success of the Pig Show was followed by a popular series of annual community-wide art projects based on birdhouses, then rocking chairs, artist palettes, cats and dogs, and finally, clocks, with “Art Makes Brandon Tick“. We’ve made a point of including local schools in all of these activities, with a portion of the funds raised going to our youngest artists in the form of an annual scholarship and grants to local art teachers for materials and supplies. As a 501(c)3 non-profit cultural organization we are dedicated to supporting the visual arts and artists through exhibitions, demonstrations and community art initiatives. Become a part of Vermont’s vibrant art community. Join as a supporting member and receive our e-newsletter, a 10% discount on gallery purchases ($100 maximum daily discount) plus invitations to Guild events. Or join the Guild as an exhibiting artist member – artists and artisans in all media are welcome to apply to our Spring or Fall juries. 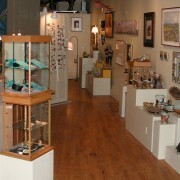 The Guild gallery is open Wednesday-Saturday from 10am to 5pm, Sunday from 10am to 4pm.